2009. Mixed media. The circular configuration of the chairs was chosen for the premier performance at the Albany Center Gallery, Albany, NY. While assisting with the re-installation of Westminster Presbyterian Church's Skinner organ, the concept of Musical Chairs came to Peter. 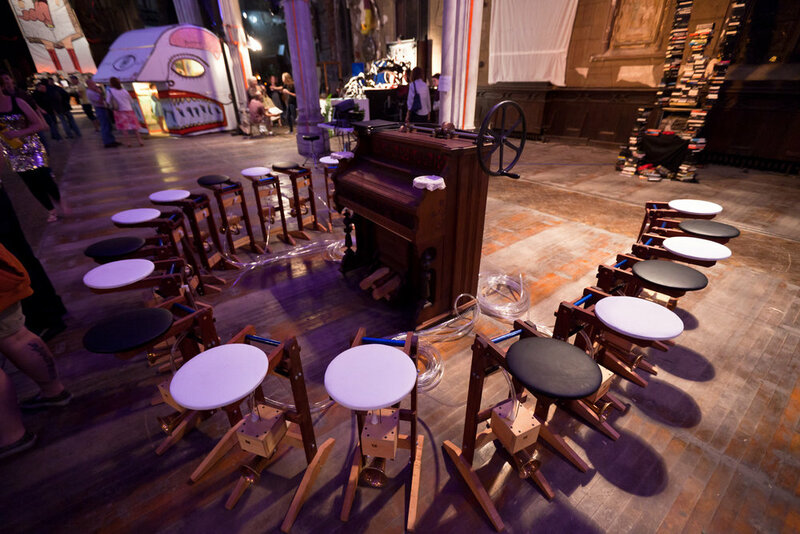 He developed the concept of 20 chairs with articulated seats to be "played" by 10 dancers, representing fingers on a keyboard. Peter also had been given two antique parlor reed organs, parts of which he incorporated into the work. Although this interactive sculpture was finished in 2009, it has been under development and construction since 2003. 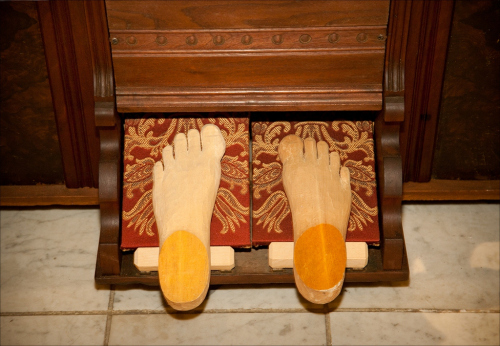 The original concept was born from my volunteer work to re-install a Skinner pipe organ back into the same church from which it had been removed twenty five years earlier. I was intrigued by the quality of craftsmanship used to create the original 1927 pipe organ, and the complexity of the handmade instrument. At the same time I had been given parts of two parlor reed organs without any intended purpose for reuse. I have always thought of furniture as functional sculpture and was focused on exploring what quality of furniture might have a musical function and the idea of musical chairs was born. I chose twenty as a random number of stools to create. They have black and white articulated seats representing the keyboard, and start at F natural and end about and octave and a half later at C natural. 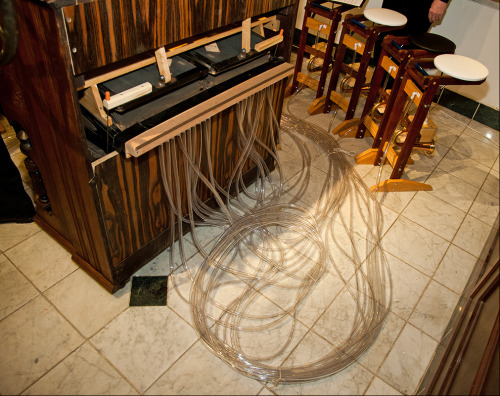 They are connected by clear vinyl tubing to the walnut console which uses the original bellows to create a wind vacuum as reed organs require negative pressure. 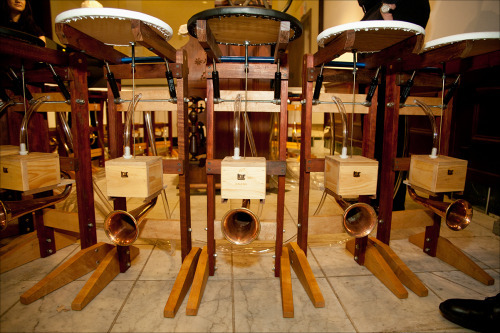 As one "sits” backwards or presses the seat, a simple valve opens, which voices the reeds in the voice box. My vision at that time was that as many as ten people, representing fingers, would “play” the seats creating a combination of music and movement-- a performance piece. I decided to introduce it with a serious piece of music and soon realized the somewhat wimpy quality of the reeds without any resonators was not going to work as well as hoped. 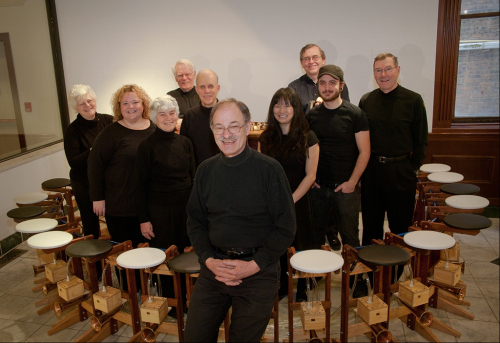 It premiered at a local gallery in 2009 and “The Musical Chairs Consort” performed Beethoven's Ode to Joy. Unfortunately, musicians are not necessarily good dancers and since we were woefully under-rehearsed, it was an accurate, if a bit stiff, result. After that, I came to realize a few things. First, I desperately needed a choreographer who would collaborate with me to make this sculpture complete by making it come alive. In 2014, I managed to connect with Maude Baum of eba dance in Albany, New York. She and her troupe enjoyed the challenge of playing with my giant keyboard. As they created a piece titled “Sonic Movement Suite” they played over, above, behind and in front of Musical Chairs completing a twelve year journey for me with an amazing performance of graceful and challenging dance. As this project progressed, I experienced many spontaneous design changes resulting from learning experiences about air movement, reed resonance, strength of materials and simple mechanisms. That process of discovery and problem solving is integral with and essential to the entire creative process for me and is what is equally satisfying with the function. This sculpture invites the passerby to discover what it does by having 400 feet of clear vinyl tubing connecting chairs to console. The victorian walnut console has a large iron crank wheel on one end that almost screams “turn me.” The copper horns have the look of loudness and the resulting visual presentation is dynamic with an edge of steam punk.